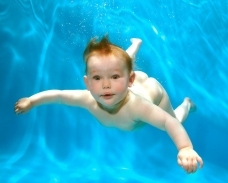 We offer photo shoots to capture the children above and below the water. 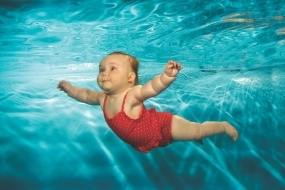 For underwater photo shoots, we recommend that children have swum at least 10 sessions with us. This is to ensure that they are comfortable being submerged. It is important that each child is treated as an individual at the photo shoots and we monitor each child to ensure they do not become too tired. An experienced baby handler will be in the water at all times with you and the children, putting their safety and enjoyment first at all times. We offer photos for all age groups and families. Our photographers are very experienced and produce lovely, memorable shots that are available in various formats and media e.g. prints, data files and canvas. Stuart Chorley has over 25 years experience as a professional photographer including 15 years as an underwater photographer. 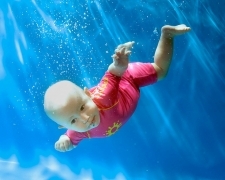 Underwater photography has become his specialty, shooting for Advertising Clients such as McCann's Japan (for Panasonic), Lowe Lintas, FCB, Grey, Publicis for Fibresure. JWT Worldwide for Shell and VCCP for O2, using Aquaimage Coral Plates. Please contact the office on 07970 043195 for details of forthcoming photo shoots in Essex and London.